Leaves skin nourished, silky and satiny. 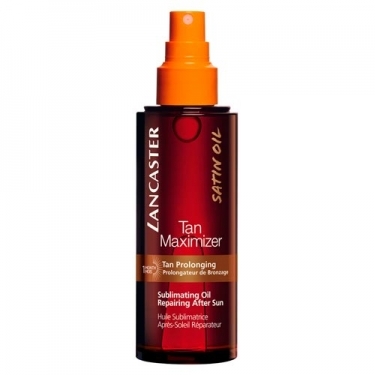 DESCRIPTION: Tan Maximizer Sublimating Oil from Lancaster is a post-solar satin oil that sublimates the tan with an instant shine for a glamorous look. Smoothes the skin intensely and leaves a silky and satiny feel after application. Protects thanks to the Antioxidant Complex reinforced with vitamins C, E and Echinacea. Calms thanks to Bisabolol, D-Panthenol and Echinacea extract. Hydration enhanced through Glycerin. And stimulate the tanning process to extend it up to 1 month after the holidays thanks to the Tan Enhancer Complex. Additional ingredient: Urucum oil rich in beta-carotene (favors tanning).